How many people does it take to change an energy saving light bulb? Well, one person can do the job and in the process will save money and help save the planet. It is by far the simplest way to reduce energy consumption in the home -literally as easy as changing a light bulb - yet the savings can be considerable. It's true that it costs a little more to buy an energy saving light bulb - the average price is about £3 - than an ordinary bulb, but the extra outlay will be recouped within a year. That's because energy saving bulbs use less than a quarter of the electricity of traditional bulbs, so a 25-watt energy saving bulb can replace an ordinary 100-watt bulb. 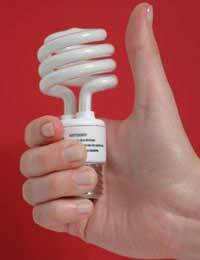 A single energy saving bulb can cut harmful carbon dioxide emissions by 26 kilograms and save up to £7 a year. As it will last 10 times longer than a standard bulb, the savings can add up to £60 in the bulb's lifetime. If every bulb in the home is changed to an energy saving one, it can cut bills by around £600 in the lifetime of the bulbs. If these energy savings were applied to every home in Britain, it would help the Government achieve the reduction in carbon dioxide emissions promised when the UK signed up to the Kyoto Protocol. Perhaps that is why there is a proposal for a voluntary phasing out of ordinary light bulbs by 2011. The timescale would give retailers and manufacturers time to develop additional products to replace traditional bulbs. Standard light bulbs are incredibly inefficient, so much so that £140 million is wasted every year in the UK by people leaving lights on unnecessarily. They work by passing electric current through a wire, which heats up and produces light. The problem is that 95 per cent of the electricity used is lost as heat. Energy saving light bulbs are different. They utilise the same technology as fluorescent lights, so electric current is passed through gas in a tube causing the tube's coating to glow. And, because energy saving bulbs are more compact than fluorescent lights, they use even less energy - up to 80 per cent less than a traditional bulb. There are down sides to low energy bulbs. For technical reasons, the glass used has to be opaque and that produces a soft light, whereas traditional bulbs can use clear or opaque glass. Also, due to the way they work, low energy bulbs take a few seconds to reach full brightness. They contain a tiny quantity of mercury, which is a pollutant, but the electricity they save means the environmental benefits far outweigh the detriments. After all, burning fossil fuel to create electricity pumps a lot more mercury into the atmosphere. There have been major advances in energy saving bulbs since they were first introduced to the marketplace, but products are still improving, both in terms of efficiency and performance. They now come in a wide variety of shapes, sizes and fittings, and there is even an energy saving bulb that can be used with a dimmer. The introduction of soft tone bulbs means low energy bulbs have a warm glow rather than the cold light often mistakenly associated with them. Halogen bulbs, while not as energy efficient as energy saving bulbs, are another option, and low voltage varieties use a third less energy than traditional halogens.